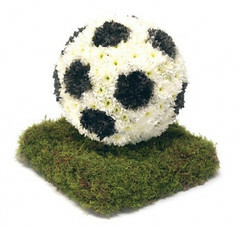 Dock AFC committee, players and supporters would all like to express our deepest sorrow and condolences to the family and friends of ex-referee, Gerry Jones, who recently passed away. Gerry was always a popular referee around the Merseyside football leagues, he was also Everton FC’s referee’s liaison officer for over 20 years. Gerry, who was also a Head Teacher, loved refereeing and knew how to cool situations down. The high-points in his long and varied career seen him as an assistant referee at a West Germany v Brazil game in 1981, as well as officiating in the Manchester derby. Gerry will be sadly missed by everyone who had the pleasure of meeting him. Posted in General News & Events by Chris Stading on February 18, 2019 at 8:07 pm. There are 3 comments. You have to go back to the early days of Cale Green to find something akin to the 6-1 score-line inflicted on them by Dock FC in the Cheshire Cup semi-final. It was no fluke, Dock taking their chances when they arose and defending in numbers when required and thoroughly deserving their win. There was a sign of what was to come when after five minutes lack of concentration from a free kick which keeper Craig Ellison thought was going out was hooked back by Matt Carlin for his captain Paul Byrne to head past the stranded keeper. With the strong wind making it hard for both teams to get any rhythm into their game there was a lull in the game where neither goal was threatened. Ellison was brought back into action by keeping out Joe Brandon’s in-swinging effort from the right. But it was Joe Brandon that set up Dock’s 2nd goal cutting in along the bye-line his low cross was finally forced home by Dave Forbes. Minutes later more problems for Cale, a penalty was awarded against them which Mark Jones duly dispatched for the third goal. Just before half time Aaron Dwyer who had not seen much of the ball got a bit of freedom on the left finding Andy Keogh with his cross who toe poked the ball home to open Cale’s account. Seven minutes into the second half again the Cale defence was at fault by not clearing their lines which left Dave Forbes the simple chance of netting his second. Cale sent on Paul Walley, Ben Brooks and Liam Tongue for Duane Ridgeway, Joe Armstrong and Alex Crowe. It seemed to fetch new life in their previous lack lustre play. From a Dwyer corner Scott Dignan’s header skidded off the top the bar. 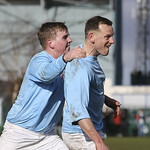 Following another goal mouth scramble Carlos Meakin saw his shot actually hit Liam Tongue on the home goal line, from the clearance up field the ball finished up in the back of Cale’s net to get Dave Forbes his hat trick. At the other end Dwyer curled a shot just wide of the post, good defending saw efforts from both Meakin and Mike Bowler cleared off the line by the Dock defenders. With only minutes left on the clock Ricci Neill should have got his sides sixth goal but shot wide from close range, it was left to Joe Brandon to get that honour outstripping the Cale defence to hit them for 6. Dock will now meet twelve times winners Queens Park in the final. Posted in General News & Events by Chris Stading on February 15, 2019 at 7:56 pm. There are no comments. Posted in General News & Events by Chris Stading on February 11, 2019 at 8:37 pm. There are no comments. 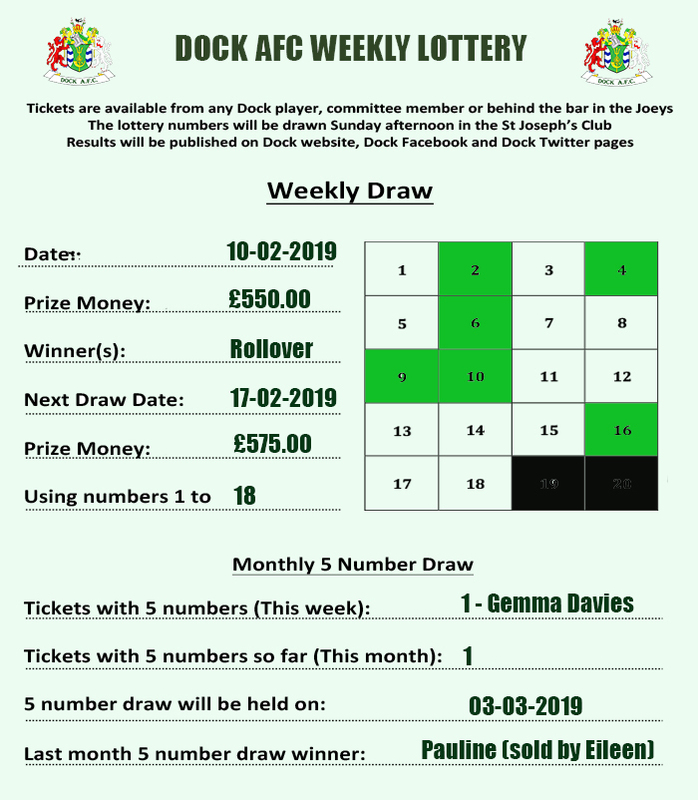 Posted in Weekly Lottery by Chris Stading on February 10, 2019 at 12:00 pm. There are no comments. Posted in Weekly Lottery by Chris Stading on January 27, 2019 at 6:36 pm. There are no comments. 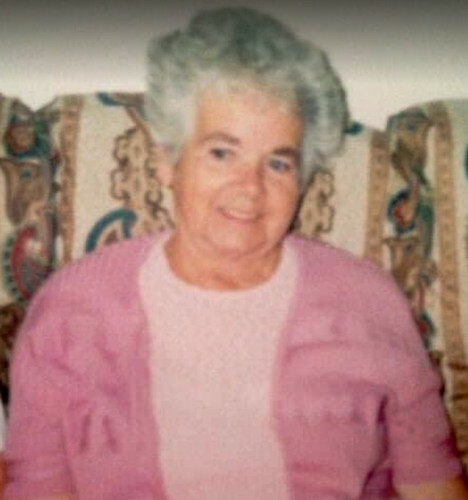 It is with much regret to have to report the sad loss yesterday of Mrs Olive Sheeran, Mother of Dock AFC Secretary, Jeff Sheeran (Scooby). 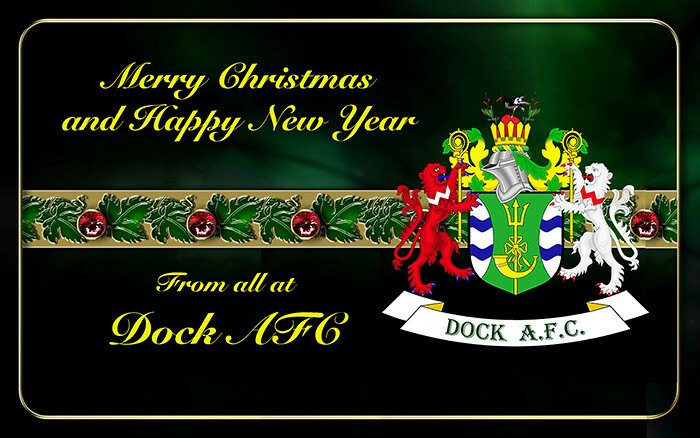 Everyone at Dock AFC would like to offer our sincere condolences to Jeff, Jayne, Sam, Elsa and all the Sheeran family during this sad time. 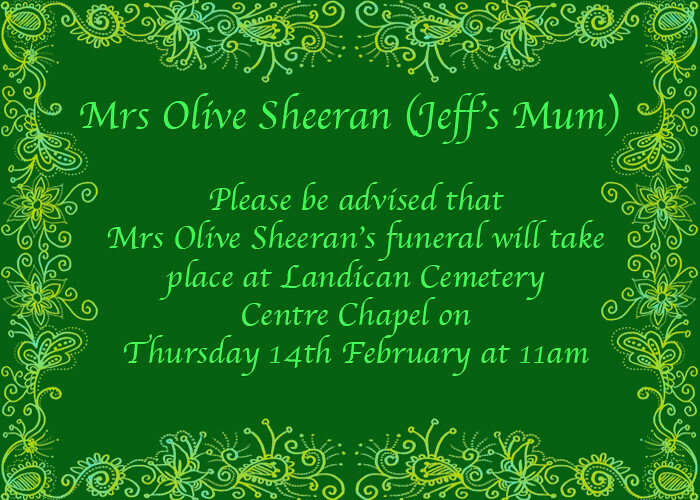 Mrs Sheeran’s funeral arrangements will be published when known. Posted in General News & Events by Chris Stading on January 18, 2019 at 8:19 pm. There are no comments. Posted in General News & Events by Chris Stading on December 24, 2018 at 3:44 pm. There are no comments. 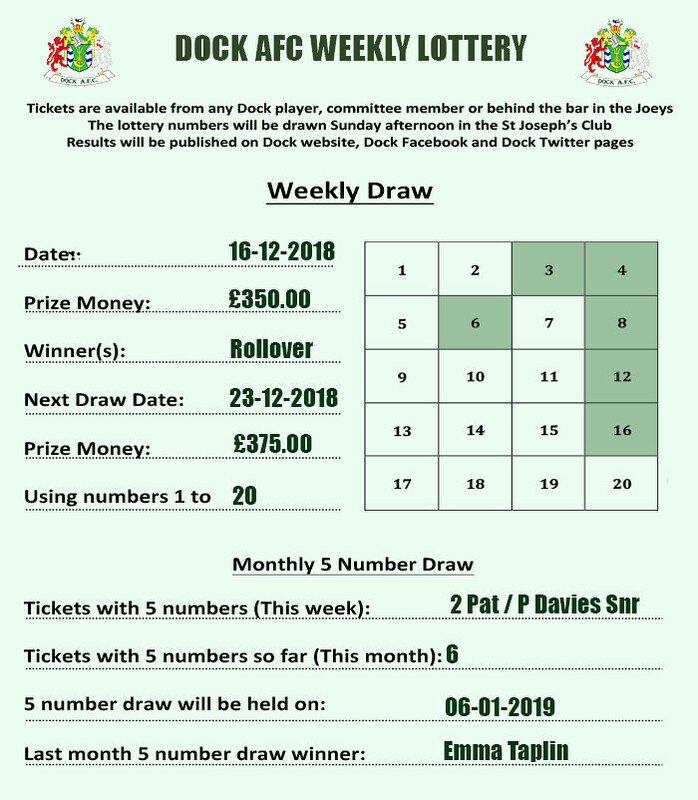 No winners this week, but 2 ticket holders had 5 numbers (Pat & Paul Davies Snr) and will join Martyn Stevenson, Mark Head, Henry Lewis and Greg Drummond in the December 5 number £25.00 draw. For players, committee members and others who have supplied fixed numbers which are entered every week (providing payments are up to date), you can check how many numbers you got this week by clicking HERE (for 30 days only). Legally, only participants who are fully paid up when the lottery takes place can be entered in the draw, no pay no play. Payments can be made in the Joey’s club of a Sunday afternoon, or to any committee member anytime or by direct debit / standing orde. Posted in Weekly Lottery by Chris Stading on December 18, 2018 at 8:29 pm. There are no comments. 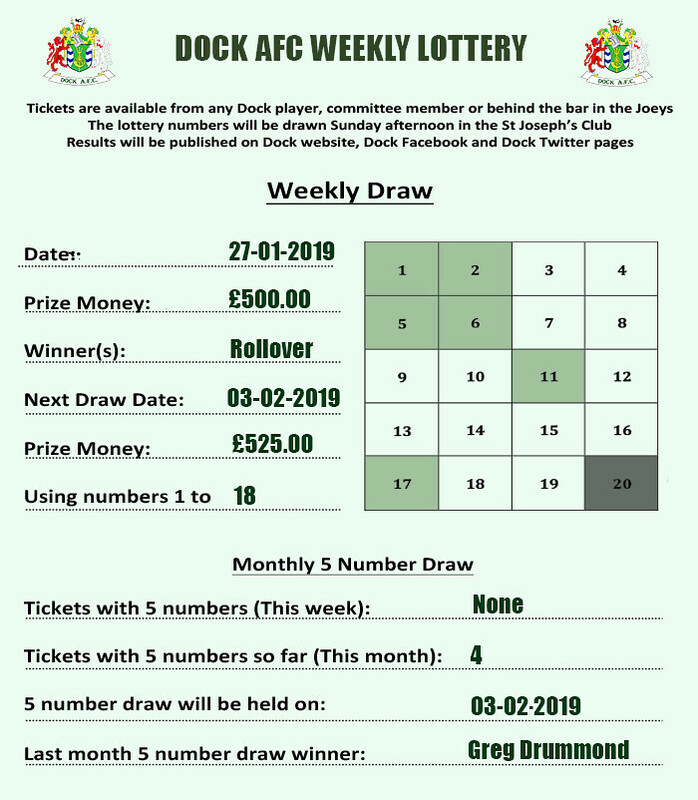 No winners this week, but 4 ticket holders were very close with 5 numbers (Martyn Stevenson, Mark Head, Henry Lewis and Greg Drummond). Emma Taplin was the only 5 number ticket for November and takes away the £25.00 prize. SUNDAY’S LOTTERY WILL BE £325.00 AND USE NUMBERS 1 TO 20. Legally, only participants who are fully paid up when the lottery takes place can be entered in the draw, no pay no play. Payments can be made in the Joey’s club of a Sunday afternoon, or to any committee member anytime or by direct debit / standing order. Posted in Weekly Lottery by Chris Stading on December 2, 2018 at 8:05 pm. There are no comments. 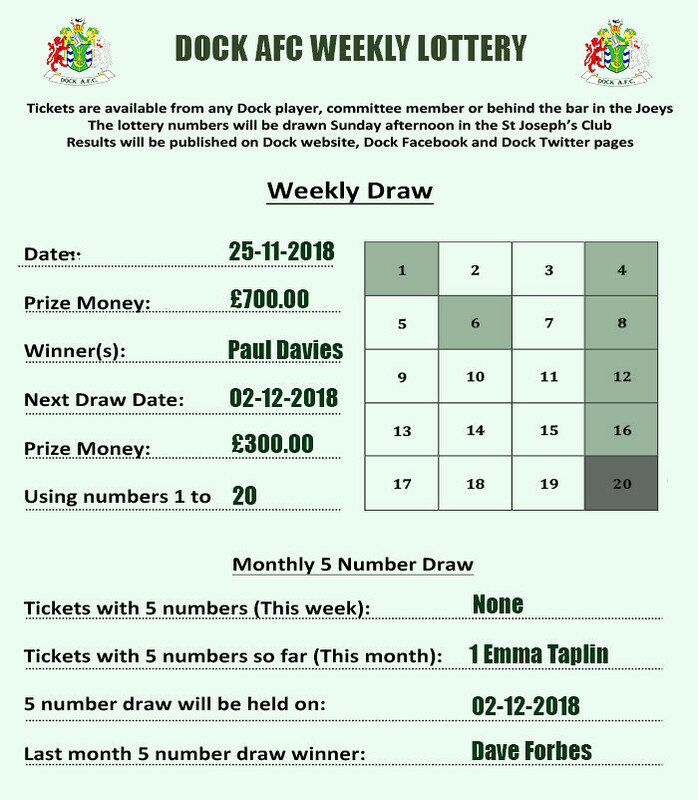 One lucky winner takes away the £700.00 jackpot this week, well done Paul Davies Snr. 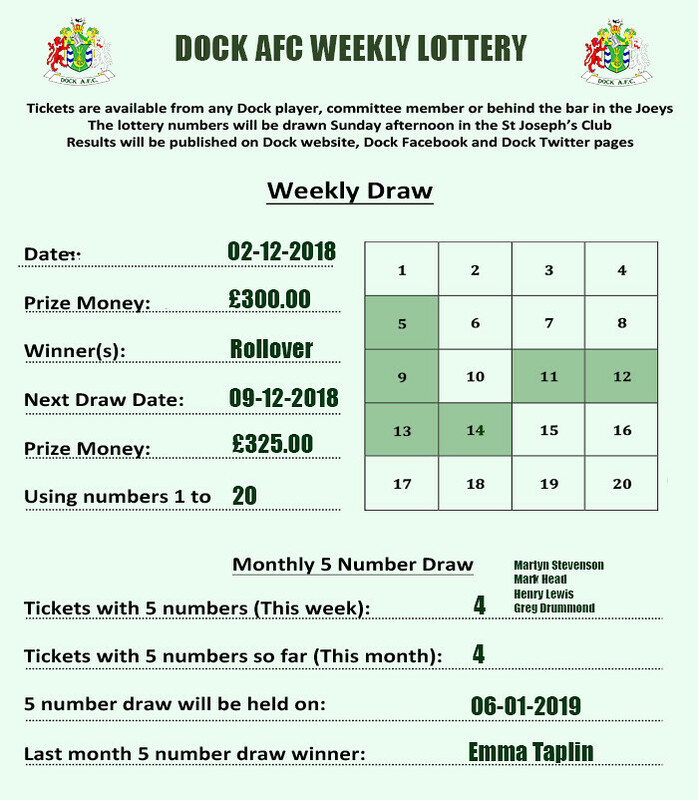 No ticket holders had 5 numbers, which means Emma Taplin was the only 5 number ticket for November and wins the £25.00 prize, well done Emma. Posted in Weekly Lottery by Chris Stading on November 25, 2018 at 7:30 pm. There are no comments.